LaVerne Marion Taylor went to be with the Lord Jesus Christ on February 5, 2019, at the age of 96. LaVerne was born to Oscar and Agnes Settergren on August 19, 1922, in Dassel, MN. She graduated in 1940 from Roosevelt High School, Minneapolis, MN. LaVerne went back to school and received her bachelor’s degree in 1977 from the University of Minnesota, graduating Phi Beta Kappa. LaVerne married Burt Taylor on August 23, 1940. He preceded her in death on October 19, 1994. They moved from Edina, MN to Carson City, NV in 1977. 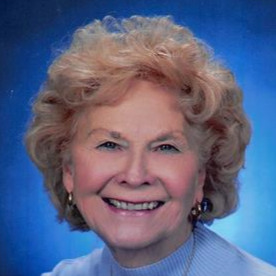 LaVerne was a long-time member of First Presbyterian Church in Carson City and volunteered many years at KNIS Christian Radio Station and Carson Tahoe Hospital. She also enjoyed performing in the annual Carson City Senior Follies. In December 2016, she moved to Shawnee, KS. LaVerne was a loving and devoted mother to, and is survived by, her 5 children, Sharon (Jim), Nancy (Ron), Glenn (Beth), Jo (Bill), Steve (Sandy); and her precious 21 grandchildren and 26 great-grandchildren. What a privilege to know LaVerne as she was a true lady. Her smile and her warm heart radiate love for God, life and all people. Reading her obituary brought a smile to my face as I read about her ties to Minnesota. I lived in Edina from 1950 to 1963 when I left to go to college. Arrived in Nevada for an adventure in 1967 and have not left. LaVerne and I often talked about the life in Minnesota: snow, mosquitoes, and all the green. We met at a P.E.O. meeting and bonded soon after that. She loved the follies and we loved watching her sharing her talents. May all the fond memories of LaVerne offer comfort to all who loved her.